Last week we posted about two brokers who had not disclosed that customer complaints had been adjudicated to arbitration awards in favor of the clients but rather continued to report them as pending up to 15 months after the arbitration award was rendered. See Bad Brokers Falsify Their BrokerCheck Records and No One Notices. Two days ago we showed that FINRA corrected these two brokers’ BrokerCheck records in Bad Brokers’ Incorrect Records Got Partially Corrected Last Week. We’ll let you know when FINRA disciplines these two bad brokers and their employers. The problem we have identified is vastly larger than just two or three brokers. Hundreds, and perhaps thousands, of active brokers provide falsified BrokerCheck reports to their clients because, like Ms. Shivaee and Mr. Gonzalez, they list arbitrations they’ve lost as pending or don’t list customer complaints at all when FINRA’s awards database includes arbitrations they’ve been involved in and where motions for expungement were not granted. Before getting to today’s fascinating examples, consider the big picture. We spent weeks earlier this year extracting data on 1.2 million brokers from FINRA’s BrokerCheck website as part of an effort to determine the extent of broker misconduct and to suggest ways reduce the harm suffered by investors at the hands of bad brokers. See How Widespread and Predictable is Stock Broker Misconduct? The BrokerCheck data is not confidential. In fact, it is supposed to all be made publicly available but FINRA will only let you or us look at it one broker at a time. If you try to look at a lot of it, FINRA will block you from accessing its BrokerCheck website. If FINRA made this data truly publicly available academics and public policy researchers would much more quickly be able to do the research that we and Egan Matvos and Seru (See The Market for Financial Adviser Misconduct) have done. The examples of bad brokers falsifying their BrokerCheck records that we released last week, again today, and will on a larger scale next week are all developed by combining FINRA’s hidden BrokerCheck data with FINRA’s arbitration awards database. Consider that for a moment. We accessed FINRA’s BrokerCheck database and Awards database with far more difficulty than necessary for FINRA to access these databases. Yet, we can find hundreds of brokers who have obviously been falsifying their BrokerCheck records to deceive clients and potential clients by not disclosing customer complaints and settlements and awards. These bad brokers should all be disciplined with fines and/or suspensions. Greg L. Lapine v Select Portfolio Management, Inc., Paul Edward Bozymowski, Mark Edward Goldsmith, Securities Equity Group, and Carin Ruth Amaradio, Case No: 10-02365 was heard by a three person FINRA panel in Detroit, Michigan in September 2011 – 5 years ago. The Award is available here. The Panel dismissed the claims against Mr. Bozymowski and found Mr. Goldsmith and Ms. Amaradio jointly and severally liable, ordering them to pay the Claimant $133,333.33. The Respondents had all filed motions for expungement which the Panel explicitly denied on page 4 of 5 of the award. The correct treatment of this 5-year old award on Mr. Bozymowski, Mr. Goldsmith and Ms. Amaradio’s BrokerCheck records seems clear: It should appear as a dismissed claim on Mr. Bozymowski’s BrokerCheck, and as a $133,333.33 adverse ruling on Mr. Goldsmith’s and Ms. Amaradio’s BrokerChecks. Let’s see what they did. Clicking on Mr. Bozymowski’s CRD number above will take you to FINRA’s BrokerCheck website and his current BrokerCheck record. FINRA will likely correct it as they corrected Ms. Shivaee and Mr. Gonzalez’s BrokerCheck records after we wrote about them last week. So, instead you should look at his BrokerCheck record as of today, July 7, 2016 by clicking here. There are no customer complaints listed on Mr. Bozymowski’s BrokerCheck just a financial disclosure about a satisfied lien. 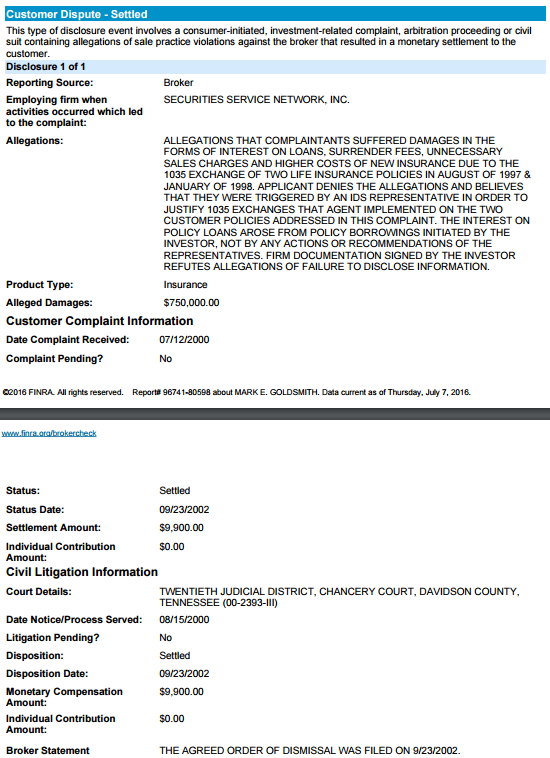 The 2010 customer complaint resulting in the award above should be listed on Mr. Bozymowski’s BrokerCheck since his motion for expungement was not granted. Next consider Mr. Goldsmith. 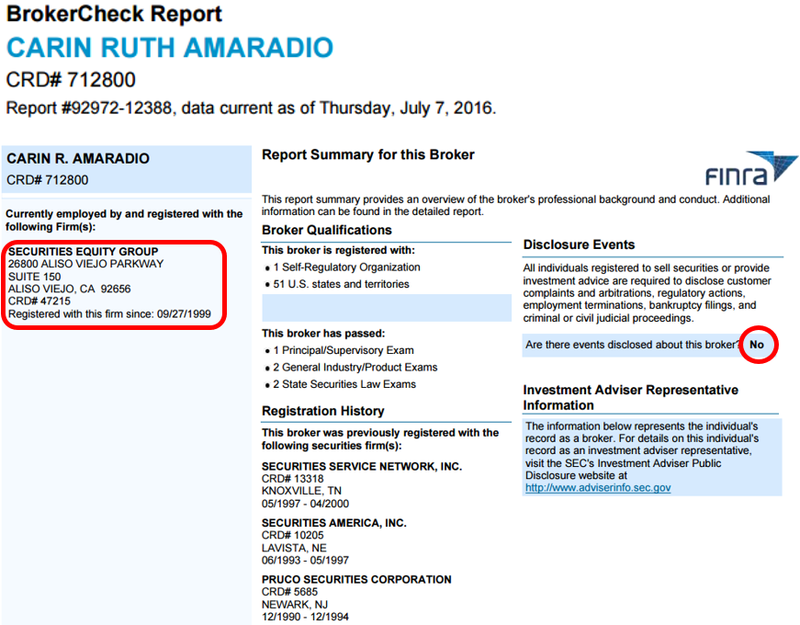 Again, clicking on Mr. Goldsmith’s CRD number above will take you to FINRA’s BrokerCheck website and his current BrokerCheck record. So, instead you should look at his BrokerCheck record as of today, July 7, 2016 by clicking here. There is one customer complaint listed on Mr. Goldsmith’s BrokerCheck but it is from 2000, 10 years earlier than the Lapine claim. The claim and adverse award in Lapine is not on Mr. Goldsmith’s CRD even though he was ordered to pay the Claimant $133,333.33 and his request for expungement was denied. Unlike Mr. Bozymowski who had a financial disclosure and Mr. Goldsmith who had an aged customer complaint disclosed, Ms. Amaradio has a pristine BrokerCheck report despite being found jointly and severally liable for $133,333.33 in the 2011 FINRA arbitration and having had her request for expungement denied. Her BrokerCheck report as of July 7, 2016 can be accessed here. This page from Ms. Amaradio’s BrokerCheck report introduces an interesting wrinkle. Her employer, Securities Equity Group, is also Mr. Goldsmith’s employer and Mr. Bozymowski had previously been registered with Securities Equity Group. Ms. Amaradio is the CEO/CCO-President of and owns 75% or more of Securities Equity Group. 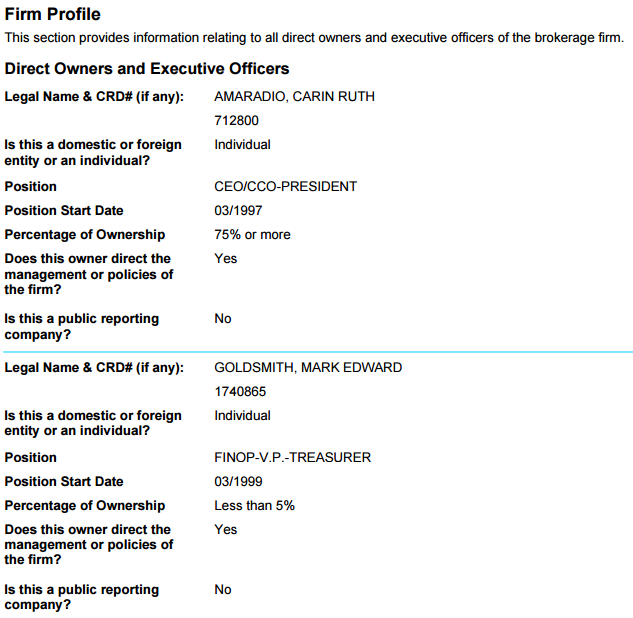 Mr. Goldmsith is the FINOP-V.P.-Treasurer and owns less than 5% of Securities Equity Group. The 5th Respondent in the Lapine claim along with the three individuals and Securities Equity Group, Select Portfolio Management, Inc. is under common control (that is controlled by Ms. Amaradio) with Securities Equity Group. The Lapine claim was against Select Equity Group, against three registered representatives including two of the executives at Select Equity Group, and against a controlled entity. This award and three brokers illustrates a few of the problems we have discovered with BrokerCheck. As owners and executives of Select Equity Group, Ms. Amaradio and Mr. Goldsmith, control what gets reported to FINRA, separate and apart from their disclosure obligations as registered representatives. Each individual in this example reflects a different abusive fact pattern we see in the BrokerCheck data. Mr. Bozymowski has no customer complaints on his BrokerCheck but should have at least one that was dismissed. Ms. Amaradio has no complaints on her BrokerCheck but should have at least one customer complaint adversely resolved. Mr. Goldsmith has one aged customer complaint that was settled on his BrokerCheck but should have at least one customer complaint adversely resolved. We identified this example and at least 75 more with our hobbled access to FINRA’s two databases which we will write about early next week. With FINRA’s unfettered access and our programming skills we’re confident FINRA could find hundreds, maybe thousands, of brokers who have not reported customer complaints, settlements and awards. These brokers all should be swiftly fined and/or suspended. 1 The claim was filed in 2010 and so should have appeared on these brokers’ BrokerCheck reports in 2010. It seems unlikely that the claim was ever on the brokers’ BrokerCheck reports, since without an arbitration award granting expungement and a court order affirming it, FINRA would not have removed the claim after it was on the brokers’ BrokerCheck.